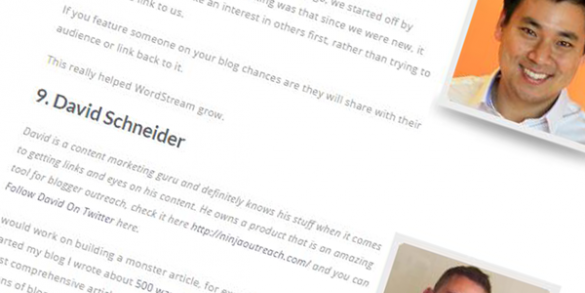 Are you fed up of hearing ways to transform your blog that just don’t deliver? You build list posts, you use the SkyScraper Technique, you even dabble in a bit of blogger outreach. This is a similar problem for most new bloggers. Getting traction for a new blog can feel like the impossible task at times. Google doesn’t want to send you easy traffic, social media sites are tightening the organic reach and your guest posting pitches are falling on deaf ears. It’s time to push all these tactics to the side and focus on a certain type of post that will send you copious amounts of traffic. Introducing the Expert-Fueled Post Type! What The Hell Is The Expert-Fueled Post Type? 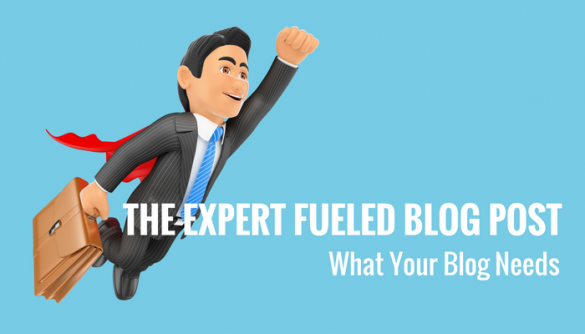 The Expert-Fueled Post is a type of content you can create that is designed to bring an explosive amount of shares. It combines a high-quality article (check out the Skyscraper Technique by Brian Dean) and an expert roundup. Simply because you are giving the article some substance, most roundup posts are long lists of expert tips. These can be good on their own but can be a struggle for folk to read the whole article. A skyscraper piece of content is an epic piece that beats the top search results in every way possible. It is the best piece of content there is on the topic. When you add these two together you great results because you provide an immense amount of value! You have taken an epic piece of content that could shine as a post on its own and given it some social proof in the style of an expert roundup. Can you see the power these can bring? Any good blog post starts with a proven topic. You can write like a world class author but if nobody is interested in what you say… your post will flop! It is simple to work out what your audience is looking for, you simply ask them. Look at your most popular posts and look out for any unanswered questions in the comments. People fail to write for the people that can take there blog from nobody to superstar and this is why the traction never gets going. Your audience will only get you so far, to really jump ahead you need to write for people who want to share your content or that will link to your content. 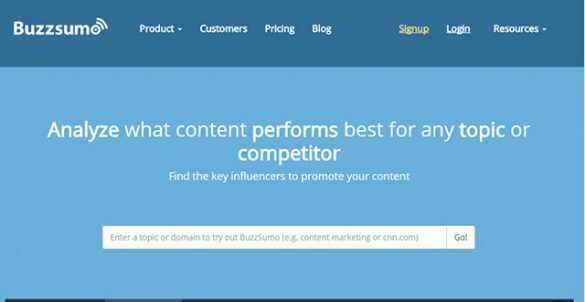 Head over to Buzzsumo, enter the URL of one of your competitors. This will display the content that has performed the best for them. This is content that has proved itself! People have shared it like crazy. Do this for 10-20 of your competitors and you will get a good idea of what people are sharing. Once you have a topic that stands out and that has proven itself time and time again you have found your topic. The next job is to create the backbone of your post. Think of the human body, we have our core muscles, if any of these are tight, weak or imbalanced, we will see problems in our limbs. Having said that if we were only our core, we wouldn’t really function! Your high-quality post part is the same, you need to make it your core. It should be strong and ready to support the rest of your post. Head over to Google and look at the top 5 results for your topic. What are their posts like? More importantly, what do they lack? If it is a list then you could simply make it a bigger list. If there are a lot of questions in the comments then you need to add that into your content. Do they use images? An image speaks a thousand words get one in there! Would a video demonstration make it a bit clearer? You are trying to stand out from the crowd here and create a piece of content that is a lot harder to beat. Remember Google wants to show the best results to their users, make sure it is yours! Once you have created that rock solid piece of content it is time to give it arms and legs, so that it can function. You are arming your post with social proof which will encourage your audience to take action. When they see their favourite bloggers they are more inclined to comment, subscribe and share the post. The beauty of this type of post is that you are providing mini roundups. So if you have 10 subtopics within your article, then this would be 10 mini roundups. What is your best tip for people tracking their intake? How can someone increase the protein in their diets? What benefits do you get from drinking 2 L of water per day? Now find 5-10 experts that have written about your subtopics or your general topic and add them to a spreadsheet. You want to do this for each question, that means you will have around 50 experts, give or take a few. It really isn’t hard to fiind these people, a quick twitter search could be enough. Your list of competitors might give you enough, just fill out the spreadsheet until you have enough experts. More than 10 per question is a bit of an overkill, so I would stay below 10. Once you have listed them, you need to find a way to contact them… can you find their email, do they respond on twitter, or do they have a contact form. Once you have a way to contact them, send them one question each. These people are too busy to answer a whole interview. Most will be more than happy to answer a really easy question though. Once you have all your answers back it is time to put it into your post. You have two assets already a high-quality article that is epic on its own. It should be able to survive as a blog post on its own. You also have a list of experts that have contributed their point of view about each of the topics. You could publish an expert roundup list post with these and still do ok.
Let’s stick them both in the content marketing blender and create our Expert Fuelled post. I like to inject the roundups using two methods. 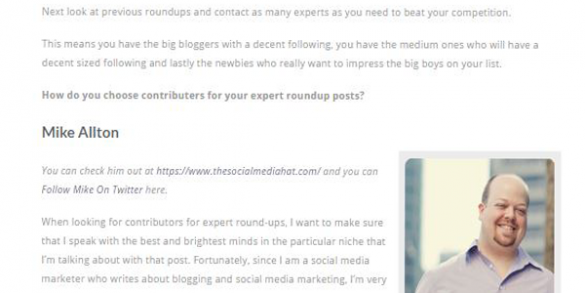 The typical list method that basically adds a mini expert roundup to the end of each subtopic in your blog post. However, if an expert has given you proof and statistics you could quote this in the article and include the proof. If you choose to quote the answer then make sure you work it in. Only using a partial bit of the answer will just make the expert feel like they aren’t getting the bang for their buck. I mean, they took their time to construct the answer. You have to be clever about the quote and make sure it still provides value to the contributing expert. If this is your first time doing this then listing a mini roundup at the end of the subtopic might be a better option. Once you have your finished article it is time to get it out there and let the world see your hard work. I always start with the easiest methods first because I can get easy traction. When you delve into the more complicated methods the initial traction will act as more social proof for your article. 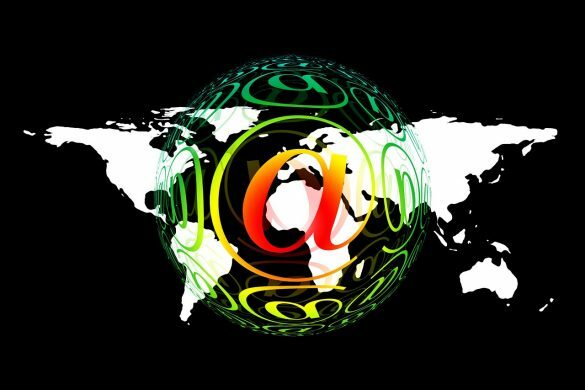 First task should be to email each of the experts and tell them that your post is live. Thank them and give them the link. I would also include a Click To Tweet link. This makes it easy for the busy expert to share your new post straightaway. If your audience would love this click here to tweet the post, if you have resource page that this post might fit into, would you consider adding it? This has led to me getting links on high authority sites just from adding this sentence into the email. There is still people that want to know about your new post. It is time to tell your existing audience by posting on all your social media profiles. If you really want to expand your reach simply tag the experts that you featured on your post. This will encourage them to share or comment on the post but it also allows their fans to see your post too. I will also email my subscribers telling them about the new post. You should also paste a click to tweet link here to encourage them to share the post. These are simple methods that can get the ball rolling. To really impress the people featured and to ensure they get some traffic you should consider using the boost feature of Facebook Ads. It is a cheap way to expand the reach of your Facebook post even further. There are a lot of other things you can do and I suggest you check out my post that will show you 17 ways to drive traffic to your blog. Having said this, these tips alone can really get the ball rolling. I hope I have got you excited to try this post type out as it really can deliver outstanding results. If you are a new blogger this on its own can get your first few hundred visitors for your post. Don’t think you have to create a new piece of content every time. If you have a top performing piece of content you can try adding a mini roundup to beef it up and give it some sharing currency. The worst thing you can do is leave the Expert Fuelled Post out of your strategy, so take action and give it a try. Have you tried this or have you tried an expert roundup list post yet? What were your results like? This post was written by Joe Elliott, the founder of One Man Wiki. After struggling for years Joe has turned his blogging career around and is really starting to make a name for himself. He loves to write about starting a blog, improve blog traffic, SEO, Social Media and affiliate marketing. Find him on Facebook, Twitter, and LinkedIn.